It seems summer is on her way out. There may be a few more gasps this week with the prediction of a few partly cloudy days allowing us to reach the low 70’s. I’m not holding my breath. But to be perfectly honest, I’m okay that we are heading into fall. I love the warm and coziness of fall, the squash, potatoes, beets, leeks, and most of all apples. My summer break is winding down as the students return to campus next week and while I haven’t been posting much, I have been cooking up a storm. 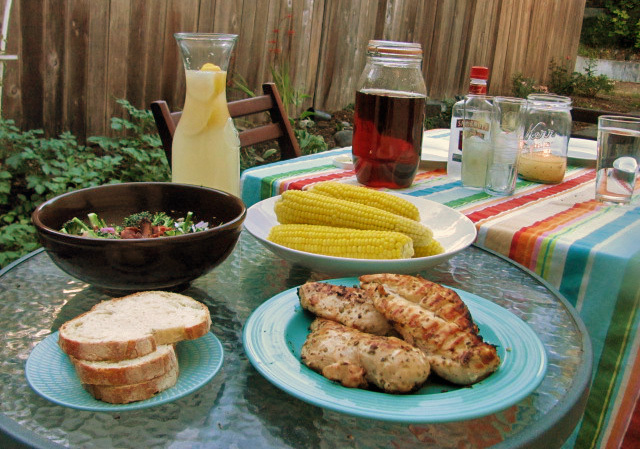 We’ve had end-of-summer dinner parties almost every weekend, some times more then one! Out of each of the parties I have had amazing recipes that I am so excited to share with you. So, enough of the chit-chat! Okay, one more thing, this broccoli salad is a classic, I would guess that most families have some version of it. My family has several versions and I grew up with it being a church pot-luck staple. I love the verticality, the freshness and the ease with which you can throw it together. For those who aren’t familiar with it, it is something of a broccoli slaw. Personally I like it way more then the cabbage version, especially with sunflower seeds and dried cranberries. It is perfect for broccoli’s fall revival. Enjoy! 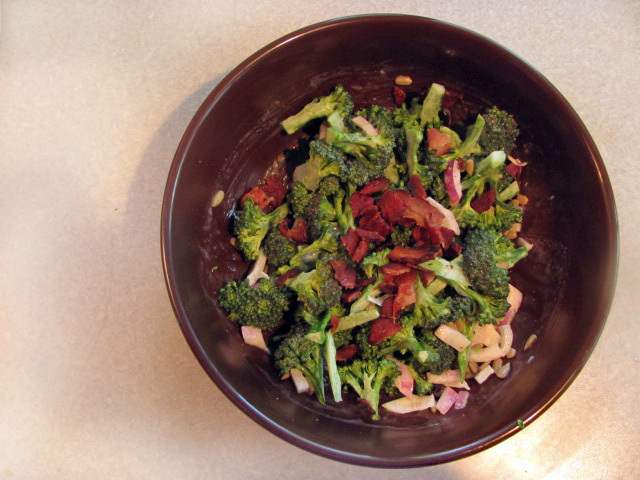 Combine broccoli florets, cranberries, sunflower seeds, crumbled bacon, and chopped onion in a large bowl. In a separate bowl or large cup, whisk together mayonnaise, vinegar and sugar. Add dressing to the salad and toss to mix well; chill thoroughly before serving. Transfer to serving bowl.